Good preaching requires resources. Bible commentaries are essential. It is better to select ones that are more ecumenical than doctrinaire. The Expositor’s Bible Commentary by Zondervan is quite good. It is a library of excellent commentaries, but has been compacted to two volumes for those who are concerned about cost. Of course, there are standout commentaries on individual books of the Bible which fully justify their price. I highly recommend a concise and reasonably priced one:The Gospel and Epistles of John: A Concise Commentary by the late Raymond E. Brown, one of our greatest Johanine scholars. His magisterial work on the John’s Gospel are part of the Anchor Bible Series:The Gospel According to John I-XII, Vol. 29 and The Gospel According to John XIII-XXI, Vol. 30. An excellent summary of his work on John is found in An Introduction to the Gospel of John (The Anchor Yale Bible Reference Library) edited by Francis J. Moloney S.D.B.. Please share your own favorites. Ideally, the preacher would be fluent in Koine Greek. Time and talent are often the limitations. But there is a way around the problem. There is no better New Testament word study than the Theological Dictionary of the New Testament by Gerhard Kittel. It is voluminous and very expensive. Fortunately it has been abridged to one volume by Geoffrey W. Bromily. Affectionately known as “Little Kittel,” it has an index of both English and Greek words and is quite user-friendly. Still somewhat expensive it is quite valuable if you can afford it. The standard lexicon for Ancient Hebrew is Brown, Driver, Briggs, Gesenius Lexicon. Bible Study Tools Online offers two excellent Hebrew lexicons: Old Testament Hebrew Lexicon – King James Version and Old Testament Hebrew Lexicon – New American Standard. Both are public domain. There are many excellent online Bible study websites. My favorite is Bible Gateway. Personal Bible study computer software tends to be pricey. Both the iPhone, iPod Touch, iPad, Kindle Fire, ctc. offer some very reasonably priced Bibles study aids with the advantage of mobility. One of my favorites is YouVersion Bible, which provides many translations that may be download free of charge along with numerous reading plans. Lastly, there is the commentaries on the lectionary itself. There is none better than Preaching the Lectionary by Reginald H. Fuller. It is still in print, on its third edition, and available from Amazon. The commentary is based on the Catholic Lectionary and there will be slight variations for those who are preaching the Revised Common Lectionary. 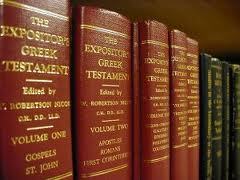 Nonetheless, the commentary has an excellent scriptural index which easily facilitates any required adjustments. It also offers helpful information on exegesis, the church year, and an overall understanding of the value of ecumenism. Do not overlook The Prayer Book Guide to Christian Education: Revised Common Lectionary by Sharon Ely Pearson. It is written for Sunday School and Bible Class teachers, but makes an excellent for preaching resource as well. I am reminded of the saying that made the rounds at seminary: “The Bible contains some very good footnotes on the commentaries.” Let us keep all these study aids in perspective.